The coming year offers a once-in-a-lifetime opportunity to build your own SCAMP with expert instructor Howard Rice, and designer John Welsford. Experience the camaraderie of a group-build experience and join one of the fastest growing sailing communities in the world. In addition to intensive building, SCAMP Camps will feature “chalk talks” on SCAMP handling, design, seamanship and more. 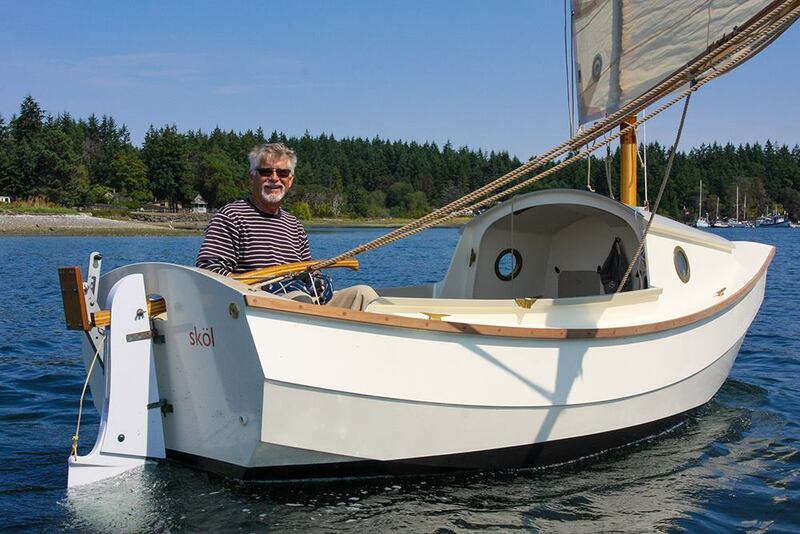 And depending on venue, Howard and John will also take builders out sailing on a demo SCAMP. Enrollment is open and space limited. Call now to reserve your spot. For additional information contact the Small Craft Skills Academy 231-838-8472 or Small Craft Advisor 800-979-1930. Numbers 161 and 162 in that second shot are my Zephyr and Dale Simonson’s Luna, siblings constructed at the first SCAMP Camp. It was a life changing experience for me. The instructors are exceptional and you leave with all the skills and confidence to finish the project. built the Tread Lightly design, a great little boat but more complicated and heavier than scamp.As I am in the sere and yellow. think this later design will be better for us Oldies.Plus a CNC bits and pieces will get me sailing sooner before I go to meet that great navigator in the sky!!! Thought I would take a moment to update folks on the coming 2015 SCAMP Camp builds. In short there has been a very positive change in the development of the SCAMP Camp program. 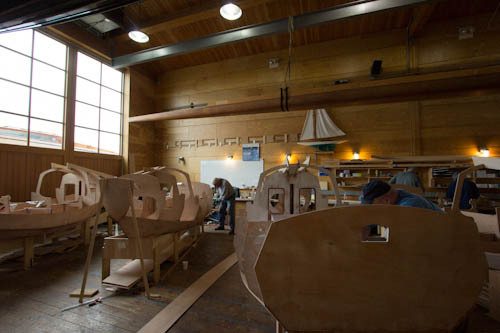 Hats off to the Northwest School of Wooden Boatbuilding and the Northwest Maritime Center for pioneering the SCAMP Camp program. Both organizations are experiencing growth and thus experience scarcity of time and manpower to continue the builds along with all else they do. So John Welford and howard rice (me) were given the nod to take over the SCAMP Camp program from the Boat School to ensure its sustainability. Josh and SCA will continue in his/their role of leading the effort as well as assisting builders and buyers of SCAMP’s. We three have worked seamlessly together with the Boat School and the Maritime Center and are very glad to be pressing on. So heres the other piece of the evolving SCAMP Camp program. John and I decided to drop the tuition significantly because we can. It’s our turn to manage the builds and call the shots, so we are trying to make SCAMP Camp possible for more folks. We plan to to keep our overhead much lower and pass this savings on to builder through a lowered tuition. We have also evolved as instructors. I have co-instructed at all SCAMP Camps to date and John had to miss one due to a family matter. If my math is right I have been involved in the building of 39 SCAMP’s to date including my own. I believe John is somewhere around 30, we have learned much in terms of efficiencies, better build techniques, cost control, etc and bring all of this knowledge to each SCAMP Camp 2015. At the end of two weeks builders drive away with a highly accurate hull they can easily complete at home given time to do so. All skills needed to finish the boat are taught and used in the SCAMP Camp builds. To date John and I have had our expenses covered for SCAMP Camps. We are very thankful to the Boat School for this assistance. We have really instructed the builds out of our desire to spend time together as friends who only see each other a couple times a year and to spend time with new friends. The Camps are very enjoyable experiences because of the comradeship between us as instructors and the builders. We truly enjoy helping sailors get their small boat dream started, better than started, far down the road in only two weeks. It doesn’t stop there. We continue to assist builders long after the SCAMP Camp has concluded and are glad to do so. So we push on into a new era for the SCAMP Class. 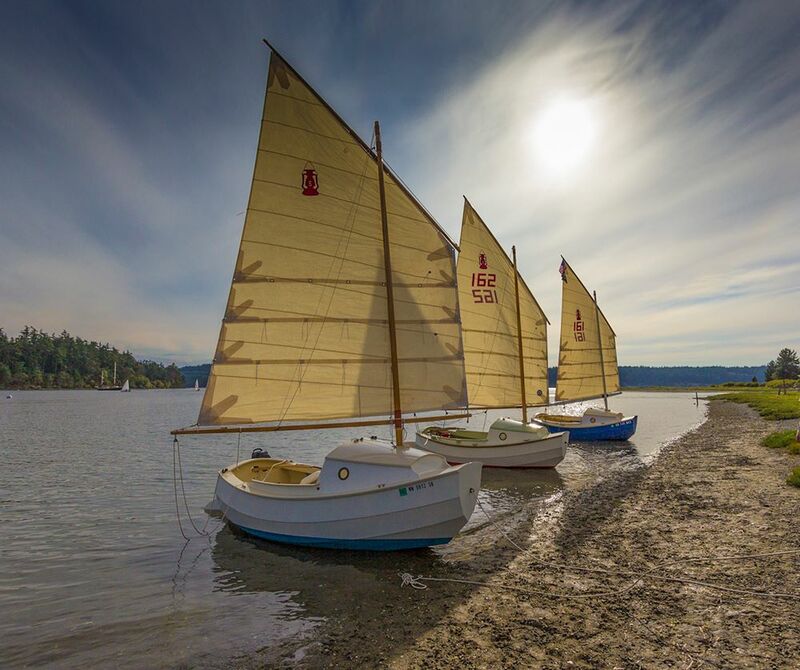 It is our hope that folks out there who are thinking about a SCAMP can come to learn how meaningful it is to build one and then sail it.There is nothing quite like the feeling of sailing a boat you have crafted and made your own. As Keith stated in his post above it is a life changing experience. Has been for us too! Feel free to email John, howard or Josh or you can call us to talk about the builds. I will try to keep folks posted here as we continue to organize the three 2015 Camps. We are also discussing one Mast Camp for 2015 if there is interest. Howard, wife and I bought our first SCAMP (from Dave Robertson), but did not pick it up until beginning of winter. We moved to Coeur D’Alene about three months ago and, as weather improves, we are antsy to visit any and all of the “some 50 lakes” people here keep talking about. Our problem is remembering the sequence to get “Cozy” ready to go. There is a need for an illustrated brochure or a video to teach this sequence. We remember little about the one-time demonstration. I’m 72 and wife is 62, so we are looking forward to learn how to sail this stable and promising vessel. Thanks Howard.